The first part of the adventure was the drive up on Friday morning. All week we had heard that we would likely be driving straight into a massive blizzard; we had even considered renting an SUV to make the trip. Instead, basing my decisions on forecast maps, I decided to stay with our Nissan Rogue, but to leave 95N just after Wilmington, taking 40E across southern New Jersey. My hope was to skirt the heavier snowfall by staying south of Philadelphia. Luckily, the storm underperformed and the drive was uneventful. By 1PM, we were in Atlantic City, and by 1:30 we were in our room on the 16th floor of the Chelsea Hotel, which was conveniently located next door to the Tropicana. We may have slept at the Chelsea, but we lived at the Tropicana. The Tropicana is part Las Vegas, part Mall of America. 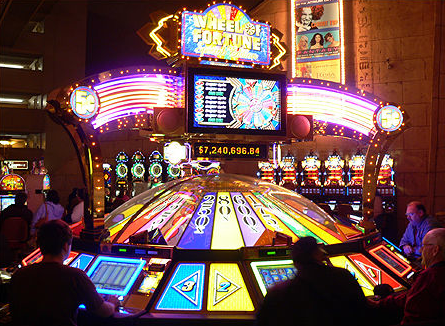 The main floor has thousands of slot machines (mainly video), gaming tables, restaurants and small bars. Branching off of the gambling area, it has a small mall called The Quarter, and a number of nice restaurants, sports bars and rooms for live shows. 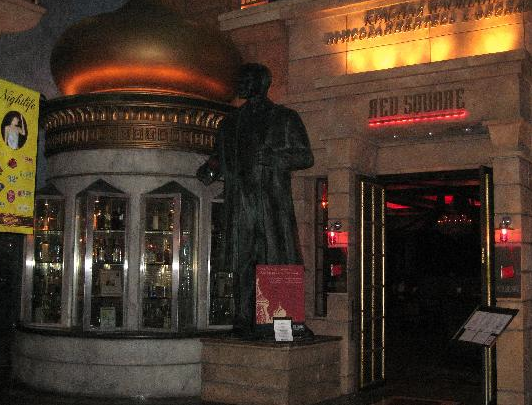 One restaurant, “Red Square,” sported a 15-foot tall statue of Lenin by its front door. The Trop also has its own IMAX theatre, which was showing Avatar while we were there (no thanks). The casino, where we spent most of our time, is a cacophony of sounds and lights. There’s pop/rock music playing from the speakers, the voices of dealers, waitresses and gamblers, plus the din of a million bells, horns, recorded voices, and digital melodies. Every machine and cluster of machines comes with its own light show, like little Christmas trees on amphetamines. And then there are the people. When I was growing up, what I knew of casinos I learned from James Bond movies, where tuxedoed men and fashionable women played expensive games, and winners and losers each accepted their fates with understated emotions. Notice: This image is nothing like the casino I was in. At the Tropicana, from what I could tell, there were mostly middle class people from all walks of life, some old, but many young; some well dressed, but just as often not. It was a predominately caucasian crowd, but not exclusively so. There are two kinds of people at the casino: those who are there for the entertainment, and there are those who are there to make money. It’s easy to tell who’s who by the games that they play. 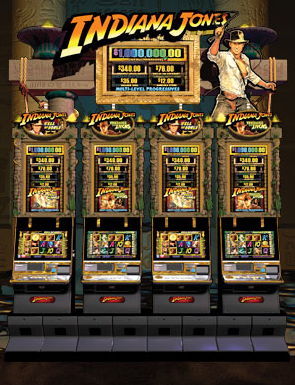 The serious gamblers play “the tables.” These are games of chance such as roulette, blackjack, poker and craps; minimum bets range upwards from $15 per play. We pretended to be serious gamblers for a few minutes on Saturday. Laurie was alone, holding her own betting at a $15 roulette table. Being the only player at the table allowed her to live the fantasy for a few minutes, until other players soon crowded around and began placing bets that put hers to shame, causing us to slink away from the table, back to the safety of our 5¢ video slots. 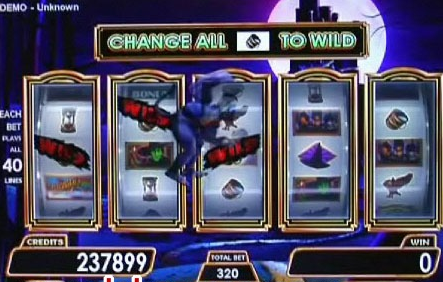 That’s another key to the “high rollers.” They prefer the real slot machines that play for $1 or more and forsake cute animation; the risk/reward is higher on these and there’s no entertainment value to offset the ugly reality of losing. We mostly stayed away from these. The Wizard of Oz (I did really well on this one; Laurie not so much) In this image, a "bonus" has been hit, and a flying monkey has appeared on the screen to change certain symbols to "wilds." If you're unsure, this is usually a good thing. The Wizard of Oz, again. 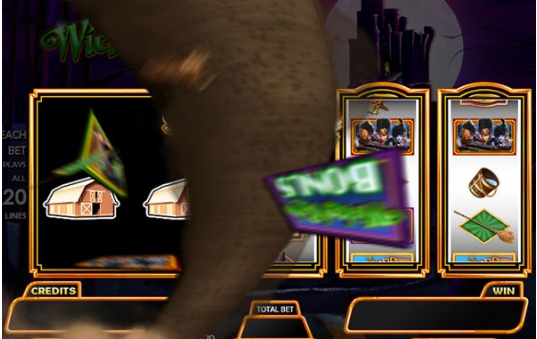 Here, a "bonus" has triggered an onscreen tornado. Remember "The Match Game" from the 1970s with Gene Rayburn? 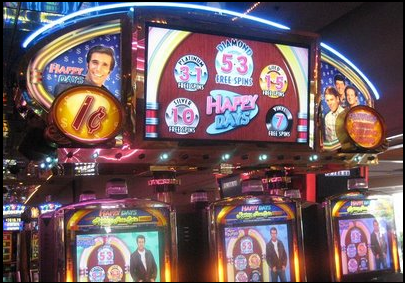 Well, now this classic piece of television history is immortalized as a slot machine. By the way, "Vicki" is Vicki Lawrence, one of the regulars on the show. "Wheel of Fortune" comes complete with voiceovers from Pat Sajak and Vanna White. If you hit the "bonus," the big wheel spins and you get the number of "credits" that stops in front of you. Playing "I Dream Of Jeannie"made me feel like a kid again, watching reruns on Channel 45. Except my parents' old console TV never took $17 dollars from me in 12 minutes. Not that I can remember, anyway. The "Happy Days" block was almost always filled. We finally got two open seats, but the Fonz just took our money like everybody else. I loved this machine. When you hit the "bonus," a stick-figure, with Dino's head perched atop, would sing the song "Go Go Go Go" for as long as your bonus held out. 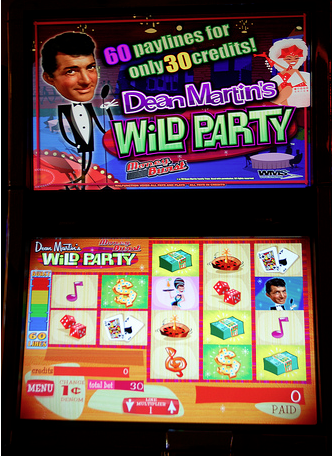 If you want to hear Dean Martin sing “Go Go Go Go” like I did at Atlantic City, click here. On Saturday night, we witnessed a scene straight out of “Jersey Shore.” On the ground floor of the Tropicana, there are a number of sports bars (and slots, of course). From what we could gather, a group of young men in tight tee shirts had gotten into a fight over one of the young ladies in their group. The ladies were all uniformly dressed in tight miniskirts with heels so high that they could barely walk without falling. We missed the fight, but got to see the twenty minutes of expletive-laden shouting and pointing as security guards herded the knots of combatants toward the exit. We experienced another eye-opener on Sunday morning. As we were walking across the street to the Trop, we saw a tall young lady dressed in knee high leather boots, fish net stockings and a leather jacket walking ahead of us with a much shorter man. The man was dressed in rumpled, baggy pants and had his gray hoodie pulled over his head, totally hiding his face. The two walked together without acknowledging the other. Laurie and my curiosity was piqued as we tried to figure out this odd couple. As they entered the casino, they drifted apart, still not talking, while keeping the same deliberate pace toward the hotel elevators. That was when we figured it out: what we had been seeing was a “John” escorting his prostitute through the casino toward the elevators (and presumably up to his room). We were amazed; it was like watching reality television come to life, right in front of us. On that Sunday morning, we decided to give the nice casino folks a little more of our money before leaving, and because it was relatively empty at the machines, we became emboldened and sat at the “big boy” slot machines. These machines even had pull-arms. We were both making conservative bets, but then Laurie decided to throw caution to the wind, hitting the “Max Bet” button, which bets 180 nickels on a single spin. I watched in horror as she lost her $9 in 2.3 seconds. We looked at each other for a moment, and then resumed our conservative play – except that Laurie forgot that since her last bet was $9, that had become her default bet. Thus, when she reflexively hit the “Repeat The Bet” button, she saw another 180 credits go away. Before she realized what had happened, though, a New Jersey miracle occurred. 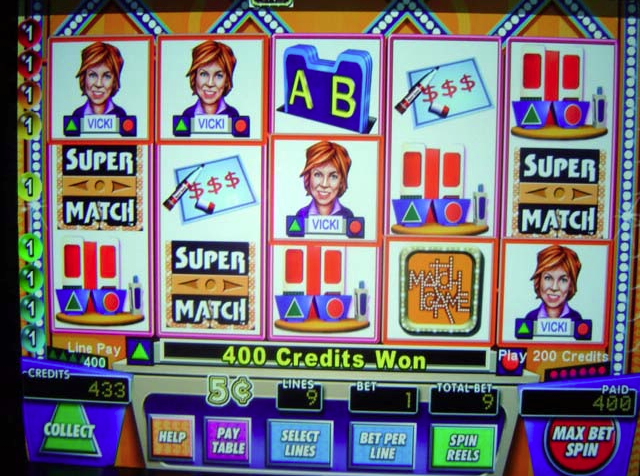 Laurie hit her big score – $100 (as it paid out, we had no idea how much she had won; we just hoped it would never stop. But this was true all weekend. 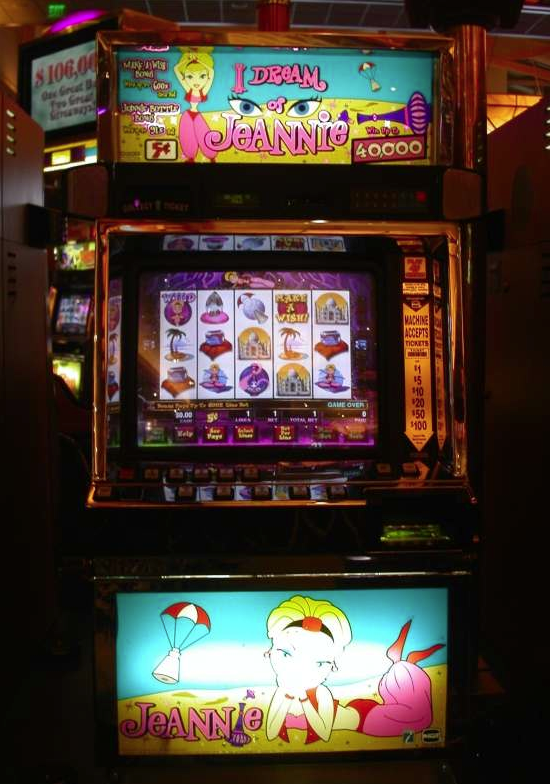 The rules for winning at slots are so confusing that it’s almost impossible to know how much you’ve won, you just have to trust the machine. I gave up trying early on, but Laurie always dutifully tried to figure it out, in vain.) We laughed as the dinging of the credit counter rolled on and on – it took about ten minutes to stop. Finally, we felt like winners. And that was when I understood slot machines. Slot machines take all of your money, and then slowly give part of your money back, all the while making a big show of the partial return of funds. Because you’re getting something and the machine’s making such a fuss over it, you feel like you’ve accomplished something, when in fact, the machine still has most of your money. Even after our “big score,” we were down about $500 to the machines. 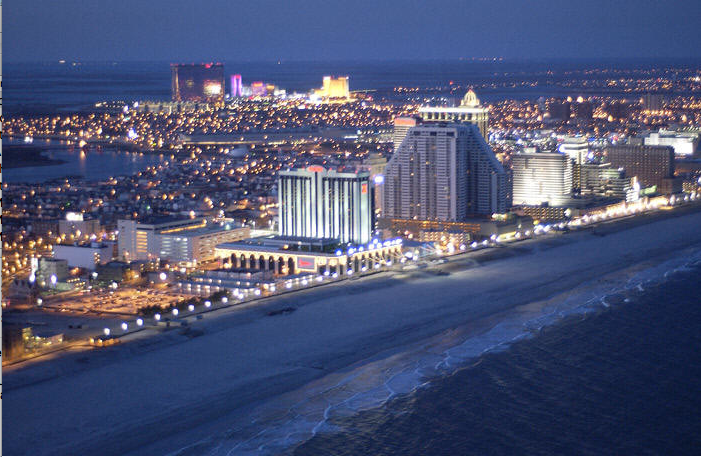 When I brought up unpleasant details such as this, Laurie gently reminded me that we were in Atlantic City to have fun, not to save our retirement. Yes, we had lost money, she would say comfortingly, but we had fun doing it. Yes, of course, I would say, that’s what’s important – but I’m not a very gracious loser, and she knows this, so we tended not to speak of the money so much. 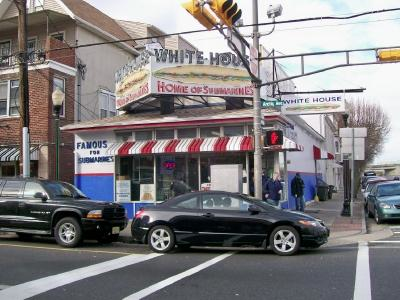 After we had checked out of our hotel on Sunday, we grabbed lunch at White House Subs, a historic landmark in a rather tough neighborhood near the Convention Center. We had been told that we “had to eat there before we left,” and since I appreciate local history and culture (if you could call it that), we parked uncomfortably on the street and walked a block or two to the corner of Arctic & Mississippi (nice dichotomy, eh? ), where we saw a line stretching out into the street. 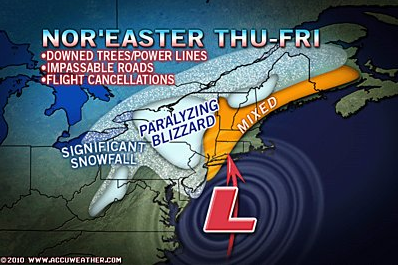 Groaning, we took our place at the end, but then a few minutes later, another New Jersey miracle! The counter lady came outside and said that they had two seats at the counter; we jumped at the opportunity and were soon seated amidst the wall-to-wall crush. 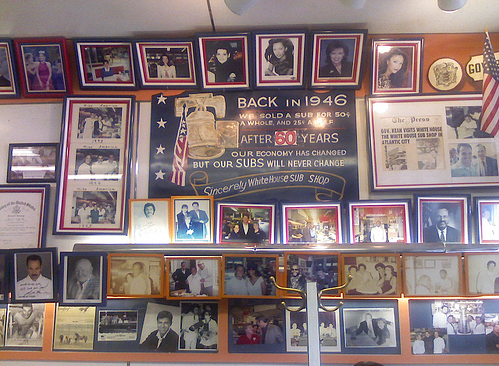 As we waited to eat, we took in the “ambiance.” The old, never-remodeled walls were covered with photographs and signed portraits of all the celebrities who had eaten there, from Sinatra to Seinfeld to Donny & Marie. 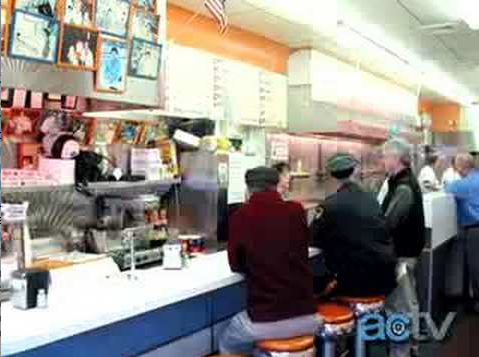 Near us, behind the counter, there was a framed montage of photos showing the Beatles holding a six-foot submarine sandwich; it was later explained to us that the Fab Four had played the Atlantic City Convention Center in 1964, and the owners had sent over the sub and a cameraman – smart guys. While we were waiting for our food, we watched one guy use a $20 bribe to cut in front of everyone else; no one seemed to mind. We were served a half sub and a can of soda each. Laurie said that her Philly Cheesesteak was very good; I thought my steak sub (with nothing but hots) was OK, but just that. After we had finished, I bought a souvenir tee-shirt for $10 and we headed home, saturated with local charm and culture. On Saturday night, we saw a performance by the Beatles tribute act “Yesterday.” They have their own little theatre inside the Tropicana called The Liverpool Club, which is decked out on the outside with huge photos of the Beatles (while the Beatles first British LP, “Please Please Me” plays in a continuous loop in the hall). Inside, it has a Cavern Club look and feel. The theatre is intimate, seating no more than a hundred, and Laurie and I got in early enough to grab center seats in the third row, about ten feet from the stage. It was a full house, so we felt lucky, and there was a nice mix of young and let’s say…older. As I inspected the stage, I was impressed by the authenticity of the instruments and the equipment, right down to the tiny Vox amplifiers the Beatles had to contend with early in their career. One thing I don’t understand is why “Ringo’s” drum set was behind a plexiglas half-wall. Television monitors on the side walls played old videos of Gerry and the Pacemakers and The Dave Clark Five while we waited for the show to start. At the appointed time, an Ed Sullivan impersonator appeared on the monitor and announced the act. The cast is Bobby Potter on drums (as Ringo Starr), Jim Lett on lead guitar (George Harrison), Don Bellezzo on rhythm guitar (John Lennon) and Paul Sacco on bass (Paul McCartney). We had seen the players earlier that evening, as they gave an interview in The Quarter on “Trop Radio,” and the first thing we noticed was that, having been together since 1986, they were easily in their fifties, which was a bit disillusioning. (Fortunately, they have nice wigs and makeup to give the proper look; although Jim Lett’s hair appeared to be his own.) What struck me as I watched from ten feet away was that, had the Beatles all survived, and not been as mythically successful, so that they were forced to relive their act every night in let’s say, Las Vegas, and replaced Ringo with Seymore Skinner from the Simpsons, this is what it probably would have looked like. (Don’t discount Seymore Skinner: remember his experience as a member of the Grammy Award winning vocal group the Be Sharps.) I suddenly became very appreciative of the fact that the Beatles quit in 1969 while they were still on top, choosing to go their separate ways rather than risk sullying perfection. They were all musically very good (watching Lett play made me even more appreciative of George Harrison). Vocally, Sacco (Paul) and Potter (Ringo) were pretty good, Lett (George) was OK and Bellezzo (John) was, well, not as good. Bellezzo makes the common John-error. (I’ve seen four different Beatles tribute acts: Beatlemania [twice], 1964, Rain, and now, Yesterday, so I know of what I speak.) John sang with a somewhat nasally voice, and many Lennon impersonators so focus in on this that they become shrill and off-key. Bellezzo was, at times, so nasally as to be difficult to listen to, with lyrics that were impossible to hear clearly. He just about completely wrecked “I Want To Hold Your Hand.” At other times, depending on the song, it was less noticeable. Potter surprised me by doing a very good Ringo imitation on “Matchbox,” although, honestly, Ringo’s lack of range makes him a less challenging task. 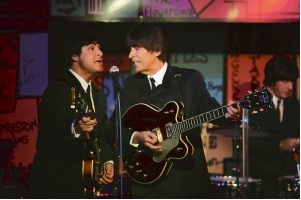 The three guitarists were excellent in imitating the mannerisms of the Beatles during the two sets of the show: the first set was circa 1964 and the second was Shea Stadium in 1965. Laurie and I both noticed that the band’s Wells Fargo badges were misplaced, but this is fairly trivial. As a last critique, Sacco (Paul) may have been pushing Paul’s onstage playfulness into caricature at times, but the audience seemed to like the interplay. During the show, the side monitors played videos of the actual Beatles, which I found distracting, and considering the age difference between the then-youthful Beatles and the now-old Yesterday, a persistent and sad reminder that these were definitely not the Beatles. After the show, and two encore songs, the players appeared in the lobby to sign autographs and to help sell the few pieces of merchandise they had for sale. I bought a black tee-shirt for $20, which they cheerfully signed. Potter (Ringo) put a lot of work into his autograph, which, had there been a crush, would’ve actually become awkward. Because I’m such a fan, and because I know so much about the Beatles, it’s hard to watch a tribute band without seeing the flaws. Still, it was a good show (especially considering that all seats were $25), and I enjoyed it. « Follow @umbchelpdesk on Twitter!